With Paul Hartley away to Bristol, I'm struggling to find someone, ANYONE, at Celtic even half as hot as Paul Hartley. As previously mentioned, I liked Paul Hartley because he looked nothing like an arrogant football player but instead, resembled a sensitive bohemian intellectual. And, I suppose, he was a good midfielder but honestly, who am I kidding?! I'm Canadian - I like hockey - what do I really know about football!? Nevertheless, in my quest to further my interest in football, I need an emotional investment in it. 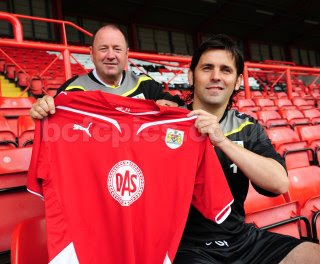 Or rather, I need a dude to crush on now that Paul Hartley is, sadly, somewhere in England. 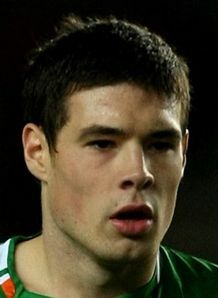 Sure, there is Darren O'Dea, who is, what I would term "cute" but necessarily "hot", mainly because he is only 22 and it just feels wrong to crush on someone so...young? However, all hope is not lost. 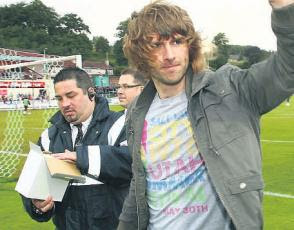 I give you Paddy McCourt (originally from Derry and 26)! Dude does not look like a footballer - more like a drummer. Or maybe a bass player in an indie band. He looks like he rocks out to Led Zeppelin and hard too. As you can see, I have a "type" and I'm the first to admit it (dark hair; dark eyes; half-way intelligent; looks like they rolled out of a dumpster; scruffy). Unlike some of my Scottish counterparts, however, I'm not really hung up on height, weight, or income. After mourning Hartley's premature departure from Celtic, I told my boyfriend about McCourt, my new Celtic crush. To which he replied, "shame he isn't very good!" Hey, like I said, I'm Canadian. Besides, who cares!? McCourt looks more like the kinda guy who would go snowboarding with me, listen to Dinosaur Jr. and drive a beat up Volvo and as far as I'm concerned, that's hot! 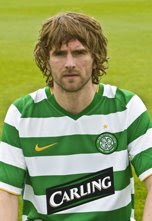 Sadly, I'm the only female in the house and hate football but I have to admit Paddy McCourt is a bit of all right. Wouldn't get me watching footie mind you! Now if he WAS actually in an indie band - he'd need to be on percussion. Ever band needs a heart-throb drummer. He looks as if he could be talented with his hands as well! LOL he does have the indie look about him! I know it's not normal but I have a crush on Paul Hartley. Anyway, check out Kyle Beckerman on the US Men's National Team.